If - and we would doubt a Pope would ever say it - but if Pope Francis said that, then Greg Reynolds would be in a position to feel hard done by. Not that he didn't deserve it, of course. After all, 'its only bread and wine' in the eyes of the Pope, so 'who would he be to judge' in terms of excommunicating Mr Reynolds. The only person who could formally excommunicate someone for giving Our Eucharistic Lord to a dog, without appearing to be a hypocrite, would be a Pope who truly believed in the Church's doctrine on the Real Presence, rather than suggesting it was 'bread and wine' which 'could do no harm'. St Paul said the opposite, that unless we examine our consciences and purify our hearts, consuming the Sacrament will bring us condemnation, spiritual sickness and even spiritual death. Giving a dog a 'symbol of Christ's love in bread and wine' frankly isn't that scandalous. If what Christ had merely instituted was merely a 'sign' or 'symbol', then that could be offensive to some Christians, but that isn't really outrageous. "Do not give what is holy to the dogs," said Our Lord. There is nothing - NOTHING - more holy in the Church's custody than the Lord Jesus Himself, the Most Blessed, Most August Sacrament of the Altar. Naturally, if a priest gives Christ to a dog he is automatically excommunicated anyway. It goes without saying that the Eucharistic Lord Jesus Christ, Who gives Himself to us, Who 'humbled Himself to accept a share in our humanity so that we may share in His divinity' has been the focus of the worship, praise, adoration and devotion and reverence of the Faithful for as long as the Church has existed. Not believing this doctrine as a husband or wife, in a family would be a catastrophe for any Catholic family. Not believing in this doctrine as a priest and failing to teach it would be a spiritual catastrophe for any parish. Not believing in this doctrine as a Bishop and failing to teach it would be a spiritual catastrophe for any Diocese. Naturally, I'm inclined to believe that if a Pope did not believe this doctrine, then the Church would be temporarily in the custody and governance of someone as potentially destructive to the Church as any atheist, because, fundamentally, if a Catholic doesn't believe Jesus Christ is truly present in the Blessed Sacrament, an atheist he or she may as well be. Hitherto, some have been inclined to believe, naively, that the debate started by Francis, Kasper and others in the Church on Communion for the divorced and remarried was about the issues of divorce and remarriage and pastoral attention to these persons. The reported comment attributed to Pope Francis concerning 'bread and wine' and how it 'can do no harm' throws the light back onto what this battle is really all about. It's not about the issues. It's about Him - the Eucharistic Lord, Jesus Christ, Prisoner of Love, Our Saviour, God and King, present in every Tabernacle in every Church around the World, we pray, until the very end of time. If in a comedy poll of Catholics, 87% believed that Cardinal Kasper should not receive Holy Communion, it isn't because they believe Cardinal Kasper isn't entitled to some bread and wine. Nor are they saying Kasper is not perhaps a jolly nice fellow. No, what matters is whether Cardinal Kasper believes that the Eucharist is truly the Body and Blood of Our Lord Jesus Christ or not. If he wants to throw Jesus Christ around to men and women in mortal sin, then he has no respect for either Jesus Christ, nor men or women who should receive Him in such manner that will bring them spiritual life, not spiritual death. Every priest, every bishop, every pope is a custodian of Jesus Christ, the loving and saving Victim who gives himself to us whole and entire under the guise of bread and wine for our salvation and sanctification. If these ministers didn't believe in the Real Presence, then that would account for the catastrophic loss of faith visible in nearly all parts of the Church, in nearly all parts of the world. Why? Because if these ministers did not believe this holy doctrine, held always and everywhere by the Catholic Church, their faith in the reality of the Resurrection and the divinity of Christ would also be very much in doubt. Ignore the title of this video, but do watch the interview with the man whose 'lady', as well as himself, is at the centre of this alarming storm. '[the battle is] about Him - the Eucharistic Lord, Jesus Christ, Prisoner of Love, Our Saviour, God and King'. That's it, really. That's what it's always been about. 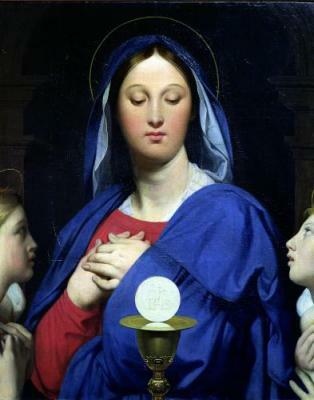 In the early Church one was Christian only by virtue of participating in the Eucharist. the silence on this 'only bread and wine' thing from Rome is supposed to steep us in the idea of it, methinks. Why wait to deny such a satanic statement? or maybe i'm just getting really batty about things. p.s. perhaps, as an Argentinian bishop, Bergoglio simply couldn't be bothered waiting for his dream of doctrine defined according to a nation's bihsops to become 'valid'. So - Argentina, don't cry for JOrge, or Julio and his lady if they prefer personal preference to Christ's Truths - watch out Eastern Orthodoxy - Frankischism is coming to a catholic church near you tomorrow. This pontificate has caused headaches galore. The more scandalous things are not denied, the more I tend to think that it actually could have been said. The present pontificate isn't exactly known for prudence when it comes to speaking. To be fair: the quotation in the Daily Mail was 'does no harm" - which according to the report the Pope applied to the receiving of Holy Communion by a divorced Catholic. (Nothing was said about the *remarried*) The 'A little bread and wine' tag was not in quotation marks as having been said by anyone, but was apparently added by the reporter or editor, in the style of a colloquialism that readers might (wrongly) assume was being attributed to the Pope. The MSM has very clever ways to sell papers by creating storms in teacups, having spotted the weakness of a Pope who makes private calls off the record, and who expresses himself unclearly in public. The worst aspect for me is the unwillingness of the Vatican Press office to clarify established Catholic doctrine.